Prior to Princess Diana it was not considered in good taste to view members of the Royal family while they were in “a delicate condition”. Indeed no mention was made of the Queen’s condition while she was expecting Princess Anne. The Queen’s sister, Princess Margaret, was captured going into a theater in 1961 and the image was almost scandalous. Shortly before the announcement of the Queen’s last pregnancy in 1963 she was photographed and then all of her public engagements were cancelled. A rare photo was captured of the Queen’s daughter, Princess Anne, in 1977 while in bloom with her first child, Peter Phillips. Another rare image in 1981 while pregnant with her daughter Zara, who is now expecting her own baby in the new year. But Diana changed many of the royal rules and one was the fashion icon’s being consistently photographed while expecting. Before her pregnancy was officially announced by the palace it was speculated that Princess Diana was expecting when she was caught napping while wearing an off the shoulder, hand painted blue and white chiffon dress by Bellville Sassoon to the V & A (Victoria and Albert) Museum opening in early November 1981. The palace soon announced Princess Diana’s first pregnancy in late November. On the day she stepped out wearing a red tweed Belleville Sassoon coat and blue John Boyd hat. January gave us the first glimpse of the Royal bump when the Princess was spotted while shopping at Harrods’s. In March of 1982 Princess Diana chose an emerald green coat by Bellville Sassoon which she paired with a John Boyd hat. At six months along the Princess wore another Sassoon dress~ a Rococo styled claret taffeta evening gown. She looked radiant while wearing a blue polka dot Catherine Walker silk dress in April. Looking so young while wearing a blue checked Catherine Walker dress at a polo match. In early June she wore a pink shirt dress that was perfectly casual for a polo match. A last sighting in pale pink before she gave birth to the Prince. The famous green polka dotted Catherine Walker dress shown with red flats was worn when leaving the hospital with Prince William in June, 1982. 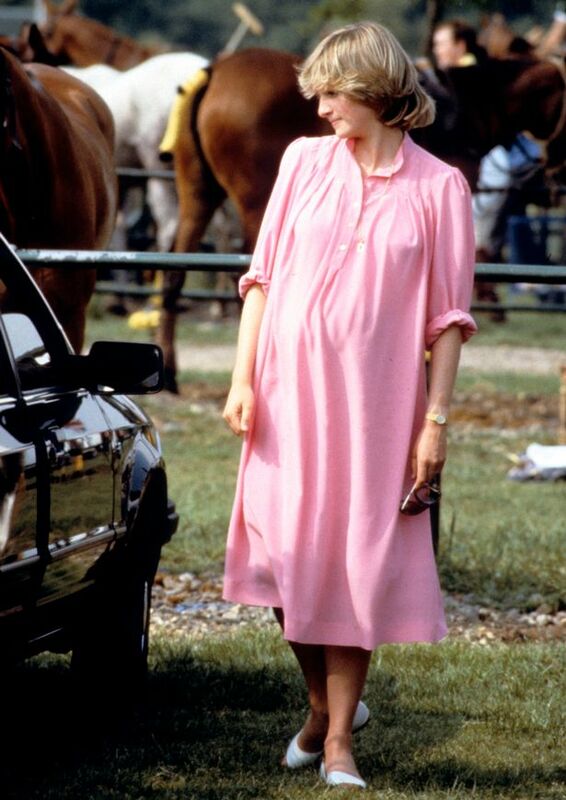 Like most mother’s, Diana wore the many of the same articles of clothing while expecting Prince Harry. She did have a new white Sassoon evening gown created to wear to the theater to see “The Little Foxes” starring Elizabeth Taylor. This was paired with the Spencer Family tiara. Sarah, the Duchess of York, often favored a nautical look as a nod to her husband’s career. While expecting Princess Beatrice she was often compared to her fashionable sister in law, which would be hard shoes to fill for most women. She kept her weight gain to a minimum while pregnant with Princess Eugenie and looked rather radiant. After waiting many years The Countess of Wessex was proud to show off her growing bump. Sophie favored classic styled separates. But the Countess was “spotted” in an animal print gown in September 2007. Like her late mother in law there has been close scrutiny on the Duchess of Cambridge’s midsection since her wedding to Prince William. While normally the palace waits the standard 3 months before making an announcement, the Duchesses acute morning sickness made the wait impossible. The public was informed in early December that she was expecting. She wore a 2010 Diane Von Furstenberg coat when leaving the hospital. On Christmas Day it was quite evident that the Duchess was still feeling a bit under the weather. She wore a brown Celeste “Hobbs” coat, a red Hugo Boss pashmina scarf and carried a Gucci clutch. In January the Duchess had just one public engagement to view her first official portrait at the National Portrait Gallery. She still looked quite slim in her “Sophie Rae” dress by Whistles. February showed just a hint of a bump when she stepped out wearing a Max Mara wrap dress. In March her figure was kept under wraps with a series of coats. My favorite was Malene Birger coat in teal blue paired with the Whiteley black beret. While attending the National Review of Queen’s Scouts at Windsor Castle she wore a mint colored off the rack tweed coat by Mulberry. In late April she was shown wearing an ice blue Emily Wickstead dress with Rupert Sanderson suede heels to the National Gallery. On May 22 Catherine wore a lovely yellow “Marella” coat by Emily Wickstead paired with a Jane Corbett hat to the Queen’s garden party. Many criticized the Duchess for wearing a short polka dot Top Shop dress which she paired with a black Ralph Lauren jacket. Early June had the Duchess arriving to the 60th anniversary of the Queen’s coronation at Westminster Abbey in custom Jenny Packham lace dress with a peach jacket and a Jane Taylor hat. A fun Dalmatian print Hobbs coat was topped with a Jane Taylor black hat for the naming of the Royal Princess ship in Southampton. Her last public appearance was on June 15th at the Trooping The Color ceremony in London, which marks the Queen’s official birthday. She wore a custom-made pink coat by Sarah Burton for Alexander McQueen and a Jane Corbett hat. No doubt her wonderful style will continue. « Royal Babies~ What’s in a name?